Montgomery makes for such pleasant reading, generally speaking. Most of the time! This past week has been a little stressful with a To Do list that feels a mile and a half long. It's been a fight, of sorts, to keep at least a portion of each day calm and quiet enough to afford for a little relaxing downtime with the family. I haven't had large chunks of time to read but when I have had time at all, I've picked up Rainbow Valley which is the seventh in Montgomery's Anne of Green Gables series. 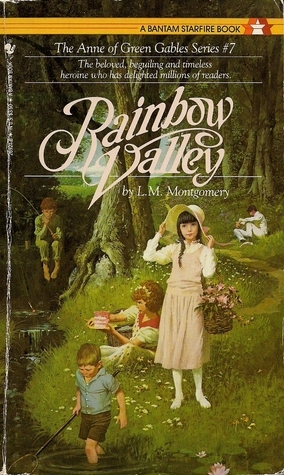 Unlike the previous books, Anne makes merely a cameo appearance in Rainbow Valley ; she is not the main character of this book. In this title, we get to know a little bit more about Anne and Gilbert's children but we're chiefly spending our time with the neighboring manse kids, the Merediths. A new minister named Mr. Meredith has come to Glen St. Mary along with his four children. His wife is dead and he more or less is trying to raise the children on his own. However, he is a very absentminded sort, lost in his own world, and that mostly due to the pain caused by the loss of his wife. The Meredith children are "on their own" so to speak and get into constant scrapes which open their family up to ridicule and scorn in the community. The Blythe children, however, love the Meredith kids and together they form a band of kindred spirits. This book is a tale of childhood adventure and friendship. At the same time, it is also a story of loss and loneliness. Rainbow Valley isn't one of my favorite of Montgomery's novels but it is still Montgomery and therefore has pleasant elements to it that I enjoy. In this case though, my negative emotions overshadow the positive ones and so this title falls further down on my "Favorite Montgomery Reads" list. Primarily, I've never liked the fact that Mr. Meredith is so lost in his own thoughts that he ignored his children. While I understand that pain can be a blinding experience and grief affects different people in different ways, there is a charge that needs to be delivered to one suffering that they still have responsibilities to see to. They need to have a band of supporters surrounding them who help them stand up, stay up, and walk through the fire. Another way of saying this is that a sufferer needs assistance to do what needs doing. They need instruction as to how to continue on in this world without their loved one in a way that does not neglect their duties. I believe it is reasonable to expect that they must carry on just as I believe it's reasonable and necessary that assistance will be required in order for this to happen. Asking someone who has just lost a loved one to proceed with life as normal is unnatural and unreasonable. The chances are, they won't be able to do it. The problem is that admitting that you need help in the midst of suffering can be hard to impossible to do. The reasons for this are numerable but one is that it might simply not have occurred to them to realize that they need help. The brain is foggy when in pain. Or, perhaps, the person feels so alone that they don't realize people are available and willing to help! This is also a possibility. Whatever the reason for lack of help, it's a bad one. Situations such as these should absolutely capture the heart of Christians because if we say we believe in God, we are not to reject or avoid His church. We are to be a part of the body of Christ. When one member suffers, all suffer with them and should surround that person with the care and help they need to see their problems and pains through. We are gifts to one another in this. We are to rise to the occasion and seek to bless and not avoid or ignore those in our community who are in need. We are called to do so, whether we feel comfortable with the job or not. In this particular Montgomery story, we see a minister's family who are greatly in need of care and compassion from their community and what they are met with instead is criticism from afar. This is neither helpful nor right. Reading this book is a sermon, of sorts, to quit thinking about one's own likes and preferences but to reach out and sacrifice of yourself so that another might live life more fully. That's a hard thing to do and I well know it. But it's the right thing to do. Putting self aside and tending to another in need is simply hard work! But if not you, then who? It's a question worth asking. As you can see, this book holds an element that just disturbs me - partly because I've lived out something like this and I have wounds. It's hard to recover from death and this book reminds me about times and situations that were full of pain and quite a bit of loneliness. I dislike the Meredith family's situation almost as much as I like and understand them. Perhaps we could say that this book cuts a little too close to home? While the antics of the Meredith and Blythe children are good fun in a Montgomery-esque sort of way, there is also something very real about their life situation which socks the gut and so it's hard to completely relax into this read. Mostly I'm glad to be done with it so that I might move along to Rilla of Ingleside . I'm certainly not trying to discourage anyone away from Rainbow Valley. Not at all! It has its fun, bright spots and for some readers those bright spots will be the whole book! Personal experience just puts this particular story too close to home for me and so it's not my favorite. Still, I'm glad to have read it again. It's in the Anne line-up and I shall not avoid it. I have this book but have not yet read it! Thanks for the review. I am participating in your challenge, reading Anne of Avonlea! Thanks for hosting the challenge. I enjoy your blog and your reviews. Have a great weekend! Good comments! These have been on my heart a lot lately. Just like to add that the same applies to any major loss or sorrow (there can be several akin to a real death). And it IS certainly hard to reach out and minister to others' hurts, for various reasons. So we all need this kind of reminder in the body of Christ. I'm a PK, so I always loved this book. I didn't really identify with Faith or Una, precisely, but somehow their stories resonated with me. "Windy Poplars" is my least favorite Anne, too. "Anne of Ingleside" is my second least favorite because I pretty much feel if you've read any Montgomery short stories, you've already read this book (just without Anne).